Share the post "S&S Precision — Building Tack-Drivers, Texas-Style"
Stick and Randall are long time tool and die makers. More than just gunsmiths, they are true Master Craftsman. They turn out barrels that look like jewerly. I have never seen work completed as precisely or as quickly. Stick is not one of those gunsmiths you will wait a year for. He works hard to get projects turned out rapidly. S&S is a full service shop. 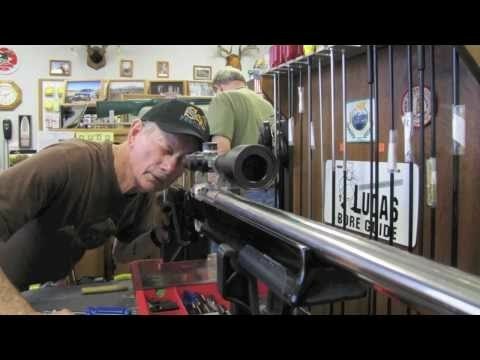 Watch our for his new .22 rimfire benchrest/F-Class rifles. I had the privlidge to be able to shoot one. What a laser! Stick built a 6.5-284 for me in Jan. It has been the most accurate rifle I have owned in my life! J.D.&Stick told what load to use and while breaking in the bbl. it shot in the 2s!this is from a heavy sporter bbl. on a L.A.Rem700 action.Their workmanship is the best ever! I too am privileged to have had a rifle built by Mr. Starks. Worth every cent paid and then some. Stick stands by his work and why not; without question one of the best rifles I have ever owned. If you want it done right, S and S Precision is the place to go. Thanks Stick!! Stick built a 7mm rem mag. I brought him all the parts on 11/22/13 and he called me the day after Christmas ready for pickup! I was really amazed at how fast he finished the gun. I broke the barrel in and worked up a load; the first three shot group on paper at 567 yards was a 1.420″ group. I’m very pleased and would recommend Don “Stick” Stark to anyone.